Isaac Asimov; American writer and professor of biochemistry at Boston University. He was known for his works of science fiction and popular science. Asimov was a prolific writer who wrote or edited more than 500 books and an estimated 90,000 letters and postcards. His books have been published in 9 of the 10 major categories of the Dewey Decimal Classification. Asimov wrote hard science fiction. Along with Robert A. Heinlein and Arthur C. Clarke, he was considered one of the "Big Three" science fiction writers during his lifetime. Asimov's most famous work is the "Foundation" series; his other major series are the "Galactic Empire" series and the Robot series. Asimov also wrote mysteries and fantasy, as well as much nonfiction. Most of his popular science books explain scientific concepts in a historical way, going as far back as possible to a time when the science in question was at its simplest stage. Examples include Guide to Science, the three-volume set Understanding Physics, and Asimov's Chronology of Science and Discovery, as well as works on astronomy, mathematics, history, William Shakespeare's writing, and chemistry. 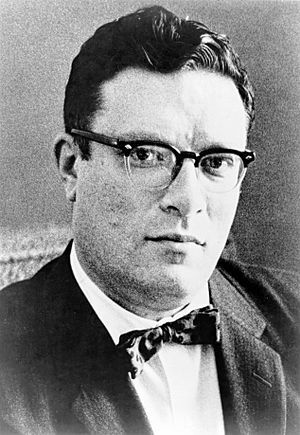 Isaac Asimov was born in Russia to a Jewish family. Asimov was born on an unknown day between October 4, 1919 and January 2, 1920, inclusive. Asimov himself celebrated it on January 2. He was taken to the United States when he was three, and learnt English and Yiddish as his native languages. He wrote many books. People know about Isaac Asimov because of his science fiction books and his science books for non-scientists. After becoming established in the U.S., his parents owned a succession of candy stores, in which everyone in the family was expected to work. The candy stores sold newspapers and magazines, a fact that Asimov credited as a major influence in his lifelong love of the written word, as it presented him with an unending supply of new reading material as a child that he could not have otherwise afforded. He became a naturalized U.S. citizen in 1928 at the age of eight. Asimov was a claustrophile: he enjoyed small, enclosed spaces. In the third volume of his autobiography, he recalls a childhood desire to own a magazine stand in a New York City Subway station, within which he could enclose himself and listen to the rumble of passing trains while reading. 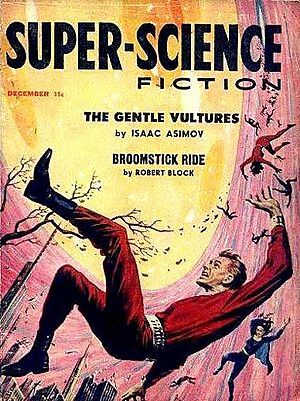 Asimov was afraid of flying, doing so only twice in his entire life. Consequently, he seldom traveled great distances. This phobia influenced several of his fiction works, such as the Wendell Urth mystery stories and the Robot novels featuring Elijah Baley. In his later years, Asimov found enjoyment traveling on cruise ships; on several cruises, he was part of the entertainment program, giving science-themed talks aboard ships such as the RMS Queen Elizabeth II. Asimov was an able public speaker and was a frequent fixture at science fiction conventions, where he was friendly and approachable. He patiently answered tens of thousands of questions and other mail with postcards and was pleased to give autographs. He was of medium height, stocky, with mutton chop whiskers and a distinct New York accent. His physical dexterity was very poor. He never learned to swim or ride a bicycle; however, he did learn to drive a car after he moved to Boston. In his humor book Asimov Laughs Again, he describes Boston driving as "anarchy on wheels." The only thing about myself that I consider to be severe enough to warrant psychoanalytic treatment is my compulsion to write ... That means that my idea of a pleasant time is to go up to my attic, sit at my electric typewriter (as I am doing right now), and bang away, watching the words take shape like magic before my eyes. 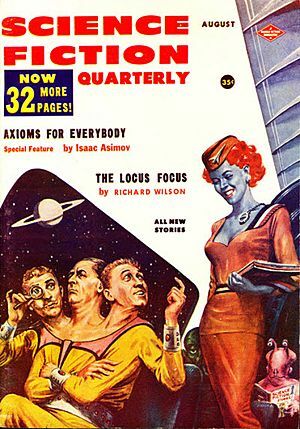 Many of Asimov's early writings were short stories published in cheap science fiction and fantasy magazines. Years later, most of them were collected and republished as collections. Well-known collections include I, Robot, The Rest of the Robots, Earth is Room Enough and The Early Asimov. In addition to his interest in science, Asimov was also greatly interested in history. Starting in the 1960s, he wrote 14 popular history books, including The Greeks: A Great Adventure (1965), The Roman Republic (1966), The Roman Empire (1967), The Egyptians (1967) and The Near East: 10,000 Years of History (1968). He published Asimov's Guide to the Bible in two volumes—covering the Old Testament in 1967 and the New Testament in 1969—and then combined them into one 1,300-page volume in 1981. Complete with maps and tables, the guide goes through the books of the Bible in order, explaining the history of each one and the political influences that affected it, as well as biographical information about the important characters. His interest in literature manifested itself in several annotations of literary works, including Asimov's Guide to Shakespeare (1970), Asimov's Annotated Paradise Lost (1974), and The Annotated Gulliver's Travels (1980). 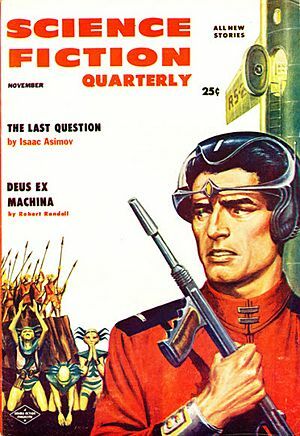 Asimov was also a noted mystery author and a frequent contributor to Ellery Queen's Mystery Magazine. He began by writing science fiction mysteries such as his Wendell Urth stories, but soon moved on to writing "pure" mysteries. He published two full-length mystery novels, and wrote 66 stories about the Black Widowers, a group of men who met monthly for dinner, conversation, and a puzzle. Asimov suffered a heart attack in 1977, and had triple bypass surgery in December 1983, during which he contracted HIV from a blood transfusion. When his HIV status was understood, his physicians warned that if he publicized it, the anti-AIDS prejudice would likely extend to his family members. He died in New York City on April 6, 1992, and was cremated. "I am an atheist, out and out. It took me a long time to say it. I've been an atheist for years and years, but somehow ... it was better to say one was a humanist or an agnostic". I, Robot (1950). Alternatively, The Complete Robot (1982). The Robots of Dawn (1983). The Currents of Space (1952). The Stars, Like Dust (1951). Pebble in the Sky (1950). Numbers 1–5 are 'Robot' books; 6–8 are 'Galactic Empire' books; 9–15 are Foundation series books. Asimov's novels have influenced science fiction on television and movie. 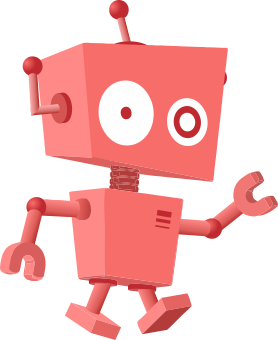 Especially his 'Three Laws of Robotics' is a lasting contribution to our thinking. Isaac Asimov Facts for Kids. Kiddle Encyclopedia.